“We would be having discussions with Irish experts who were associated with the peace process in Ireland. The Irish have also struggled for their rights like us. 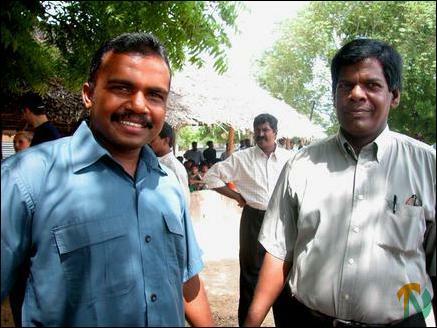 Their experience and knowledge will help us better understand the intricacies of negotiating peace”, Mr. S. P Thamilchelvan, the head of the Liberation Tigers’ political division told TamilNet while waiting at the Kilinochchi town grounds to board the Sri Lankan Air Force helicopter to Colombo Thursday morning. 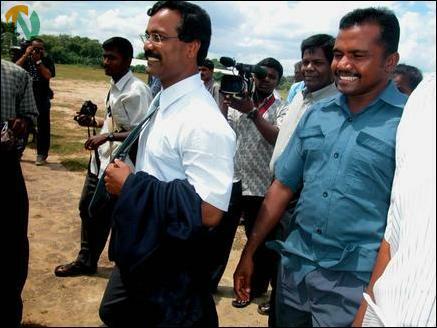 LTTE’s senior commander for the east, Col. Karuna and Ms. Thamilvizhi, a senior official from the Tigers’ political division boarded the flight with Mr. Thamilchelvan. “We need to examine matters relating to the interim administration once more with our constitutional experts. This is untended to be the conclusive meeting of our constitutional committee. We will also be meeting experts who are knowledgeable in peace negotiations. Their advice would be useful to us”, Mr. Thamilchelvan said, speaking to the press about the purpose of the LTTE’s team’s visit to Ireland. TamilNet: We understand that Mr. Bob Rae, former Premier of Ontario, Canada, would also be attending the your deliberations in Dublin? What would be his role? Mr. Thamilchelvan: “We would be getting useful and constructive advice on constitutional and legal matters from international experts. But the deliberations on the draft proposal would be held separately with our experts of our own constitutional affairs committee. “Our program in Ireland will take a week and will be in three stages. We have created a body for planning and economic development. We will be meeting economic and development specialists from the Diaspora in Dublin for this purpose. Then our constitutional affairs committee will meet. And finally we will have consultations with international legal and constitutional experts”, he said. Mr. S. Pulithevan, secretary general of the LTTE’s peace secretariat, Ms. Selvi, the deputy secretary general, Mr. Jay Maheswaran, economics affairs advisor to the LTTE, Mr. Thooyavan, head of the Tamileelam Economic Development Organisation will also being joining Mr. Thamilchelvan and Col. Karuna, LTTE officials in Kilinochchi said.